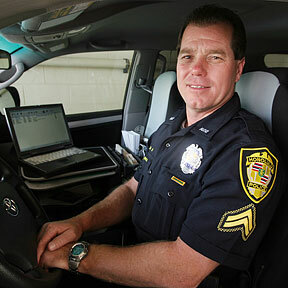 HAWAII'S TOP COP: Police officer Zane Hamrick, shown here in his patrol vehicle at the Kailua police station, saved a woman who fell into a sinkhole in Kailua after the Oct. 15 earthquakes. The rescue earned Hamrick recognition as one of the nation's top law enforcement officers. He will receive the honor next week at a ceremony in Washington, D.C.